PATTY GAYNELL MULLINS, 82 years of age of Vansant, VA, passed away Tuesday, April 9, 2019 at the Buchanan General Hospital following an extended illness. Born in Buchanan County, she was the daughter of the late Edom and Edgar (Matney) Mullins. 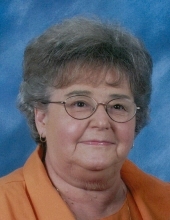 She was a lifelong resident of Buchanan County and was a member of Vansant Presbyterian Church. She was a loving daughter, sister, aunt and a salesclerk who enjoyed knitting and crocheting. In addition to her parents, she was preceded in death by 2-Sisters: Georgia Evans and Juanita Love. Those left to cherish her memory include 1-Brother: Victor F. (Marty) Mullins of Midlothian, VA; 2-Sisters: Helen Sword of Abingdon, VA, Regina Jones of Richmond, VA.
Also, survived by several nieces and nephews. Funeral Services for PATTY GAYNELL MULLINS will be conducted Saturday, April 13, 2019 at 11:00 A.M. at the Grundy Funeral Home Chapel with Ryan Willey and Mike Rife officiating with burial to follow in Mountain Valley Memorial Park, Big Rock, VA.
Friends may call at the Grundy Funeral Home Chapel Friday evening at 6:00 P.M. Active Pallbearers will be Nephews and Friends. Grundy Funeral Home of Grundy, VA is honored to serve the family of PATTY GAYNELL MULLINS. To plant a tree in memory of Patty Gaynell Mullins, please visit our Tribute Store. "Email Address" would like to share the life celebration of Patty Gaynell Mullins. Click on the "link" to go to share a favorite memory or leave a condolence message for the family.